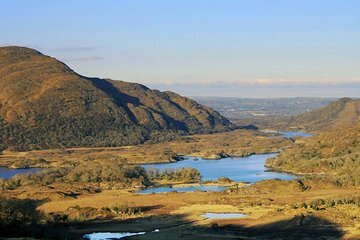 Discover a breathtaking landscape of rolling hills, lakes, emerald peaks and rugged Atlantic coastline on a private tour of the Ring of Kerry tourist trail from Cork. Considered one of the most scenic drives in southwest Ireland, the journey takes you through the ‘Wild Atlantic Way’ — an unspoiled and inspiring territory rich in beauty and legends. Pass through charming towns like Killarney, Killorglin and Waterville while a private driver and guide shares captivating local history and traditions. This tour was the highlight of our trip. Craig was such an amazing guide— he went out of his way to make our experience a remarkable one. He was very knowledgeable and was very accommodating. Craig, thank you for taking us to the Kerry Cliffs and for making us laugh throughout the day. All the love from Toronto and Miami! i highly recommend this tour. Our tour guide was Tony and he was great. He was knowledgeable, funny, entertaining and polite. He took in to consideration what we wanted and changed any details accordingly. This was our favorite tour by far.